KNOXVILLE, IA – August 11, 2018 – Brad Sweet forever etched his name in the history books, edging 10-time Knoxville Nationals Champion Donny Schatz by 0.133 seconds in the second-closest finish in the 58-year history of the event. A Green-White-Checkered finish brought the sellout crowd to their feet with Sweet remaining loyal to the bottom and Schatz pounding the cushion. 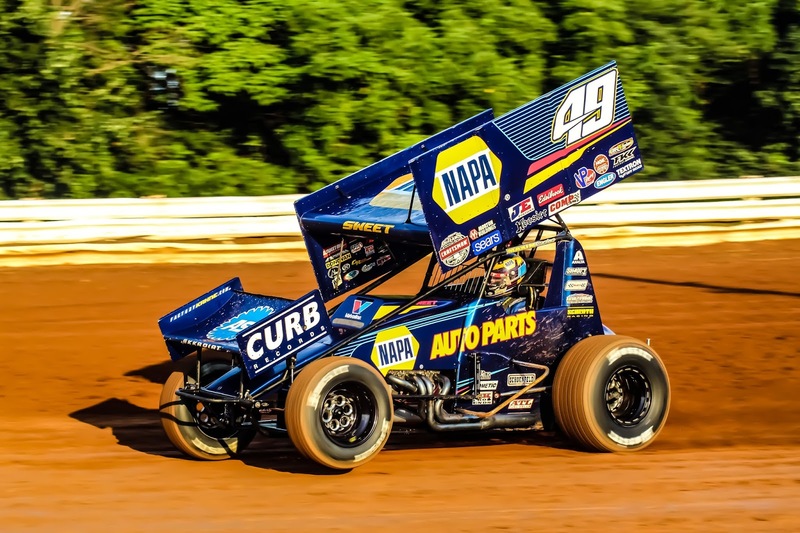 As the NAPA Auto Parts, Kasey Kahne Racing No.49 crossed the line in front of Schatz, the city of Knoxville erupted with positive emotion in celebration of a new winner. Kyle Larson led Lap 28 and 29, but settled for third to land on the podium for the second consecutive year. Sweet earned the pole for the 50-lap, $150,000 to win Feature with the highest points total of the 97 drivers entered. Sweet dominated the first 25 laps of the event while Schatz and Larson waged war for the runner-up position. At the mandatory caution on Lap 25, Larson had secured second from Schatz and would get the first crack at his brother-in-law and fellow California native, Sweet. Sweet made a rare error on the bottom on Lap 27, allowing Larson to get a run on the cushion to lead down the backstretch and officially take the lead on the 28th lap. Sweet, determined as ever, went back to work on the bottom of the racing surface and took the lead back on Lap 30. “I knew I messed up bad, so I wasn’t surprised to see someone roll by. I wanted to get that lead back,” Sweet said of Larson getting by him in the middle stages of the race. The entire capacity crowd knew that they had not seen the last of Donny Schatz. The current World of Outlaws Craftsman Sprint Car Series points leader rolled by Larson with 10 to go and began closing the margin on Sweet, who sits second in Outlaw points. The intensity was rising as Schatz closed in on the NAPA No.49, seeking his 11th Knoxville Nationals title. Sweet remained committed to the bottom and took the two-to-go signal with a comfortable, but not unsurmountable lead, over Schatz. And then, the Red Flag flew for Kerry Madsen, who was uninjured in the accident. A collective gasp could be heard from the 21,000 plus fans, knowing the 2018 Knoxville Nationals would come down to a Green-White-Checkered finish. The intensity, excitement and anxiety from the capacity crowd could be felt as the cars re-fired for the two-lap dash for $150,000. Schatz knew Sweet would remain loyal to the bottom, so he had no choice but to put his Tony Stewart Racing No.15 on the cushion. The difference between the duo was less than a car-length as they rolled by the packed backstretch grandstands and into turn three and four. The entire crowd rose to their feet as Sweet and Schatz took the White Flag. Sweet on the bottom, Schatz on the top, the crowd roaring, that’s what this sport is all about. At the line, Brad Sweet edged Schatz by 0.133 seconds in the second-closest Knoxville Nationals in the 58-year history of the event to score the $150,000. An emotion-filled Sweet pulled into Victory Lane to pandemonium and unparalleled enthusiasm from his family, friends, crew, car owner and hundreds of fans. “This is surreal. I’ve been dreaming about this, working at this, my entire life,” Sweet said. “I am forever etched into the Knoxville Nationals history books. When asked about the heart-pounding Green-White-Checkered finish Sweet didn’t hold back, “I think I held my breath. I really had to buckle down and hit the bottom the best I can. I couldn’t see [Donny], but I could hear him, I could hear a pitch of the engine on the outside of me. It doesn’t matter how much you win by as long as you win,” a jubilated Sweet said. Donny Schatz settled for second and the $75,000 payday, not a bad consolation prize. “It was a lot of fun, that’s what it’s all about. Of course, it would have been more fun if I won,” Schatz said with a grin. “I knew if I wanted to win the race, I had to go somewhere else. There was enough [on the top] and I thought I had a good shot at Brad, I was praying for another lap when I came to the checkered. He didn’t make any mistakes, did a great job and got there first,” Schatz said. Kyle Larson finished third and was excited for his brother-in-law Sweet, but talked about being a little tight and got had a good chuckle when Sweet said, “This is the first thing I’ve beaten Kyle at,” in reference to capturing a Knoxville Nationals title. Texas’ Aaron Reutzel continues to cement himself as a top-tier 410 Sprint Car driver, backing up his Hard Charger honors last year with a fourth-place finish. Tim Kaeding, in a second Sides Motorsports entry, charged late to finish fifth. Carson Macedo, aboard the Jason Johnson Racing No.41, was excellent all weekend long and finished sixth with Chad Kemenah finishing seventh. Logan Schuchart charged from 19th to eighth, Shane Stewart came from 15th to ninth and David Gravel completed the top-ten and earned KSE Hard Charger honors, advancing 13 positions from his 23rd starting spot. As you read this, the small town of Knoxville, Iowa is beginning to slowly shift back to its quiet, unassuming normal state. But not after one of the most unforgettable Knoxville Nationals in the 58-year history of the event. The World of Outlaws Craftsman Sprint Car Series continues its 40th Anniversary season next weekend with a pair of dates in North Dakota, starting at River Cities on Friday, August 18 before heading to Red River Valley Speedway on Saturday, August 19. Feature (started), 50 Laps, NT: 1. Brad Sweet (1); 2. Donny Schatz (4); 3. Kyle Larson (3); 4. Aaron Reutzel (5); 5. Tim Kaeding (10); 6. Carson Macedo (8); 7. Chad Kemenah (2); 8. Logan Schuchart (17); 9. Shane Stewart (15); 10. David Gravel (23); 11. Ian Madsen (11); 12. Tim Shaffer (7); 13. Jacob Allen (12); 14. Gio Scelzi (9); 15. Greg Hodnett (14); 16. Dominic Scelzi (25); 17. Daryn Pittman (22); 18. Parker Price-Miller (21); 19. Brock Zearfoss (24); 20. Matt Juhl (20); 21. Paul McMahan (19); 22. Kerry Madsen (6); 23. Terry McCarl (16); 24. Rico Abreu (13); 25. Brian Brown (18). Lap Leaders: Sweet 1-27, Larson 28-29, Sweet 30-50. Hard-charger: Gravel.